Visit this beach and contemplate its iconic crag, located in the middle of the sea, while you enjoy practising your favourite water sports. Praia da Arrifana beach is located in a lovely shell-shaped cove away from the wind and swell, next to a fishermen’s area in Aljezur, Algarve. 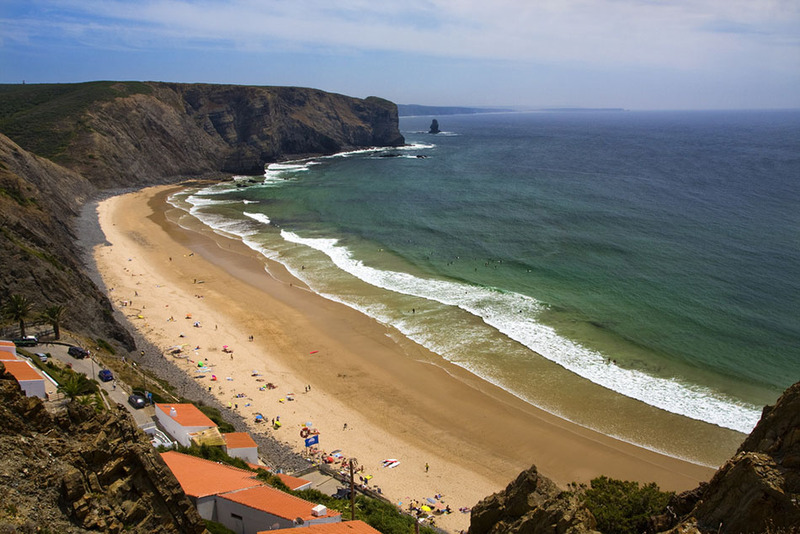 Its large and narrow sandy area is delimited by black steep mounds, being worth to discover Pedra da Agulha, an enormous peculiar crag located in the sea that has become an icon in this coastal area. This beach is in quite good conditions for diving, as well as one of the favourite ones for surfing and bodyboarding lovers. From the ruined Arrifana Fortress you will enjoy of a wonderful panoramic view. Further north is located Ponta da Atalaia, where are erected the remains of a Muslim Ribat, a great archaeological valued convent. Parking, restaurant, WC, and lifeguard during the summer time.